GrünerVeltliner is synonymous with the Austrian Wine market. Just as Argentina has adopted Malbec and for Rioja: Tempranillo, Austria is famous for this incredibly versatile, crisp grape that is currently at the top of my list. As a sushi and asparagus lover, I am incredibly pleased to see Grüner Veltliner as the wine of choice for these foods. What’s even better? Despite the cooler weather GrünerVeltliner isn’t out of style. The cr isp acidity and light body of the wine enhances the natural flavors in Thanksgiving turkey and vegetable sides. I had the opportunity to taste two Grüner Veltliner from the Laurenz V winery produced by Lenz Moser III on Friday afternoon: Singing 2008 and Charming 2006 (Folio Fine Wine Partners)on Friday afternoon, which turn out to be a perfect start to the weekend and a perfect pick-me-up for such a rainy and unpleasant day. Laurenz V winery focuses solely on white wines and is backed by six generations of wine makers. Despite being the same grape, these wines showed significant variation in flavor profile and each have a story all their own. Singing is a collaboration between Laurenz V. and his daughter, now 6th generation wine maker, Sophie. The wine was packaged to appeal to a younger generation – and that is does. 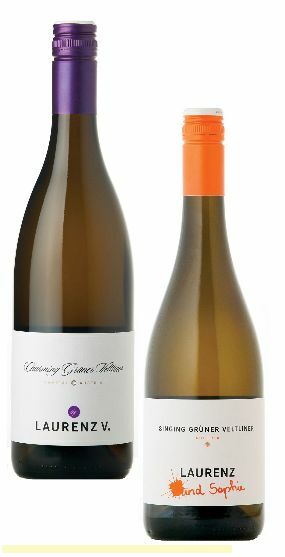 The fun white and orange label alludes to a young, vibrant wine that fills the bottle. The wine is light in body and is full of young citrus fruits, pineapple and spicy white pepper. On the other hand, the older and more sophisticated Charming, from the Kamptal region expresses defined wine personality and is packaged to appeal to women. The wines aroma is definitively light and airy, but the palate shows a rich, pleasurable quality that has incredible length. Defined, ripe pineapple and green apple fruits add to this wines “charm” as Laurenz V.’s signature wine. Luckily I have two bottles of each, so I can’t wait to indulge again!